Hi there, my darlings!! Today I have a VERY exciting post for you! As some of you who follow me closely know, last weekend Jill of Glisten and Glow can to spend some quality girl time with me and, as always, she brought some new goodies to show me! 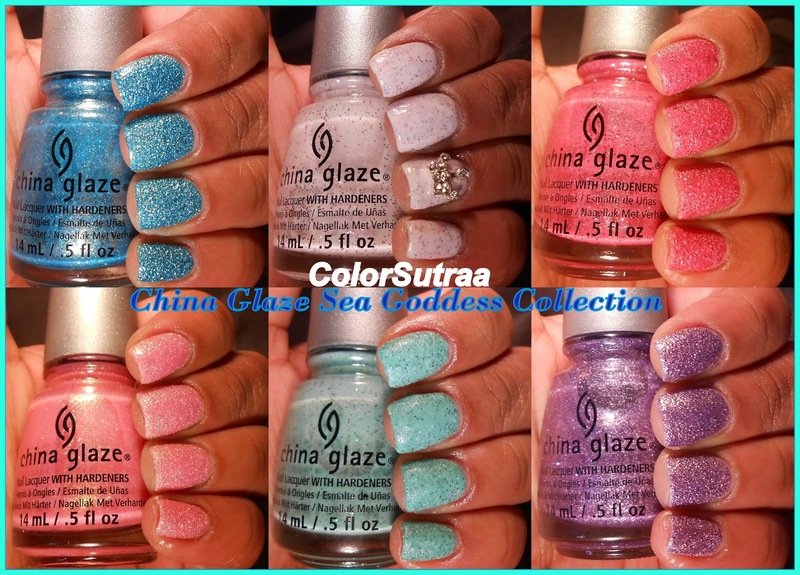 This time, the lucky lady had managed to snag the entire new China Glaze Sea Goddess collection and, just because she loves me, she let me swatch them all for all of my lovely readers! YAY! 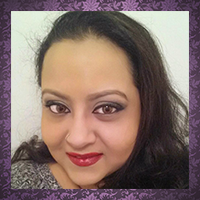 First, I have for you Tail Me Something--a gorgeous medium purple texture with silver shimmer. This one was one of my favorites! Next, I have for you Teal The Tide Turns--this polish was a cross between a mint and a green-leaning teal texture, with added fine darker green glitters. This color just screams "Spring" to me! The third polish I have for you is Wish On A Starfish--a baby pink texture with gold shimmer. While the gold shimmer is very pronounced in the bottle, it's not quite as prominent on the nail but you can still definitely see it running through the polish in certain lights! So girly and feminine! The fourth polish in this collection is Sand Dolla Make You Holla--a white texture with added multi-colored microglitter. This one was a tad creamier and less grittier than the others in the collection. The swatches below show two coats topped with 1 generous coat of G&G's HK Girl, plus a crown nail sequin accent on my ring finger. I have to admit this one was my least favorite of the bunch--it just didn't look right on me. Next up, I have for you Shell We Dance--a medium pink texture with lighter and darker shades of pink microglitter. I really liked this one and I think it would look just as good with a coat of topcoat! I'm going to throw my favorite G&G's HK Girl over it and show you at some point! Last but definitely not the least, I have for you my absolute personal favorite, Seahorsin' Around--a vibrant aqua blue with intense silver shimmer. Just look how gorgeous this is! I have to say I'm in LOVE! So, there you have it my darlings!! Now, I'm not a huge fan of textures, but there were some definite winners in this collection, which I myself would add to my collection and wear happily! Keep your eye out for these beauties to hit your local nail supply salons shortly! You can also keep up with China Glaze's FACEBOOK PAGE, TWITTER, or INSTAGRAM for all the latest updates!! How do YOU feel about textures? Which of these polishes is YOUR favorite? I'd love to hear from you in the comments section below!